ALDHELM, St. Aldhelm began his studies at St. Augustine's Abbey in Canterbury, England, and went on to the Abbey of SS. Peter and Paul in Malmesbury, Wiltshire, England, Where he received monastic tonsure and continued his studies under St. Mailduf (17th May), eventually teaching there as well as becoming Abbot in 675. In 705 St. Aldhelm was consecrated first Bishop of Sherborne in south-western England, serving that See until his repose in 709. He was the first Englishman to attain distinction as a scholar, and much of his work in Latin, which was composed in an elaborate style and drawing on an impressively wide range of authorities, survives to this day. St. Aldhelm also took a prominent role in the reform movement initiated by St. Theodore of Canterbury (19th September), and is believed to have been the founder of several monasteries and churches. it hath borne fruit for Him an hundredfold. O venerable one, pray thou unceasingly that our souls be saved. 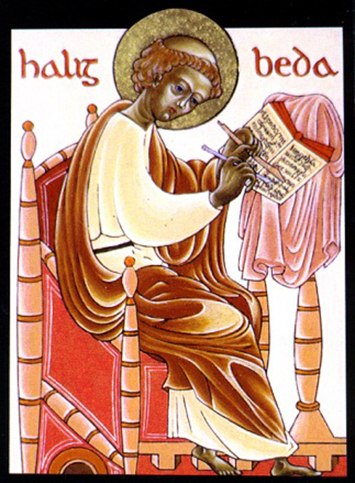 BEDE the VENERABLE, St. Bede the Venerable (also called The Venerable Bede), was an Anglo-Saxon monk, biblical exegete, hagiographer, and historian. He was the foremost and most influential scholar of Anglo-Saxon England. St. Bede was famous for his prodigious learning, and even more so for the holiness of his life. In the early Middle Ages, it was common for families to dedicate a child to a monastery at a young age and place him there to be raised and educated. So, at the age of seven, St. Bede’s family placed him at the monastery of SS. Peter and Paul at (Monk)Wearmouth-Jarrow in Northumbria, England under St. Benedict Biscop (12th January). He was ordained to the deaconate at the age of 19 and to the priesthood by St. John of Beverley (7th May) at the age of 30. Aside from brief excursions to Lindisfarne and York, Bede spent the remainder of his life at Jarrow, devoting himself to prayer and scholarship, reading, teaching, and Scriptural exegesis. Although his best-known work is Historia Ecclesiastica Gentis Anglorum (The Ecclesiastical History of the English People), which gained him the title “The Father of English History”, St. Bede wrote on many other topics, from music and musical metrics to scripture commentaries. It is thought that during St. Bede’s time the library at Wearmouth-Jarrow was one of the largest in England, and it is clear from his work that St. Bede had an in-depth knowledge of all the library contained. His proficiency in patristics, as well as his knowledge of the great classical writers was unrivalled. St. Bede’s writings provide rare insight into the religious and secular life of early Britain. St. Bede was dictating an Anglo-Saxon translation of the Gospel of St. John, as well as a book of extracts from the writings of St. Isidore of Seville (4th April) when his breathing became laboured, and his feet began to swell. The student taking the dictation told St. Bede “Dear Master, there is one sentence left unfinished”. Bede said, “Very well, write it down”, then the young monk said, “It is finished now”. To which St. Bede replied, “You have spoken truly, it is well finished”. St. Bede then asked that his head be raised so that he could see the church where he had always prayed, and after saying “Gloria Patri et Filio et Spiritui Sancto”, fell asleep in the Lord. He was approximately sixty years of age. There is no agreement on when or why St. Bede received the title “Venerable” other than it was soon after his death. Originally buried at Jarrow, his relics were later translated to a raised tomb at one end of the cathedral in Durham, England. St. Bede is also the only Englishman to appear in Dante’s Paradise (Paradiso X.130) ; he is mentioned among theologians and doctors of the church in the same canto as St. Isidore of Seville (4th April). DIONYSIUS of MILAN, the eleventh Bishop of Milan (Italy), succeeding St. Eustorgius I (18th September). His support of St. Athanasius the Great resulted in being banished to Cappadocia by the Arian Emperor Constantius II (r. 337–361) four years after consecration. St. Dionysius reposed in exile circa 359. In 375, St. Ambrose of Milan (7th December) had the relics of St. Dionysius translated to Milan, where they are current enshrined in the Cathedral. DUNCHADH, St. Dunchadh, Abbot of Killochuir in south-eastern Ulster (perhaps Killough, Co. Down, Ireland), became the eleventh Abbot of Iona. He served in that capacity from 707 until his repose in 717. However, his tenure was interrupted for several months in 713 for reasons now unknown to us. During his tenure as Abbot at Iona, the monks adopted the Roman tonsure and Roman calculation of Easter (vide Paschal Controversy). EGILHARD, an Abbot of the Abbey of the Abbot Saint Benedict of Aniane and Pope Cornelius (abtei Kornelimünster) near present-day Aachen, Germany. St. Egilhard was martyred by Viking marauders at Bercheim present-day North Rhine-Westphalia, Germany in 881. GENNADIUS, abbot-restorer of San Pedro de Montes, in Bierzo, Leon. St. Gennadius was consecrated Bishop of Astorga circa 895 and served the See until circa 931 when he retired and returned to San Pedro de Montes to live his final years as a hermit. St. Gennadius reposed circa 936. GERBALD, REGINHARD, WINEBALD, and WORAD, SS. Gerbald and Reginhard were monks, and SS. Winebald and Worad were hierodeacons at the Abbey of St. Bertin in Saint-Omer in present-day Pas-de-Calais, France. All of whom were martyred in 862 by Danish invaders. 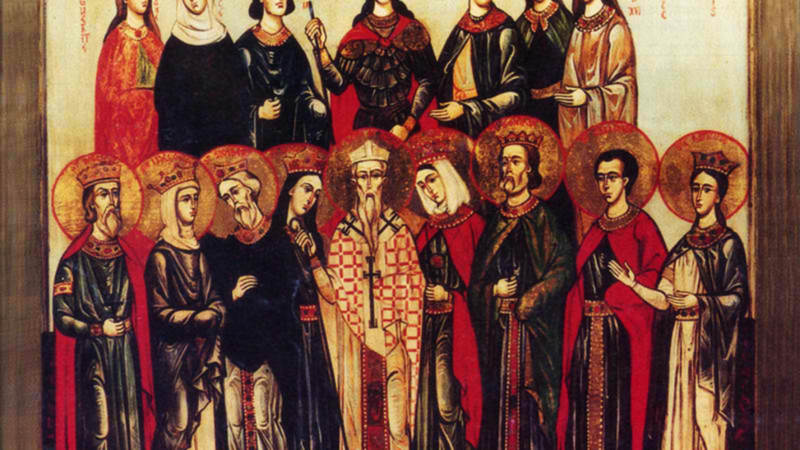 INJURIOSUS and SCHOLASTICA, a married couple in the Auvergne (France), who lived as brother and sister. Their holiness of life was testified to by the many miracles that were ascribed to them. SS. Injuriosus and Scholastica reposed circa 550. LEO of TROYES, an Abbot of Mantenay near Troyes (France). St. Leo reposed circa 550. MAXIMUS and VICTORINUS, two brothers sent by Pope Damasus I (11th December) to evangelise northern Gaul (France). They were both martyred circa 384 near Evreaux. URBAN I, elected the seventeenth Pope of Rome 222. St. Urban papacy coincided with a period when the Church was left to flourish in peace. He served the See of Rome until his repose 230. ZENOBIUS, a pagan who converted to Christianity was an adult, and was later ordained to the priesthood, and then elevated to the rank of an archdeacon. St. Zenobius was a friend of St. Ambrose of Milan (7th December), and advisor to Pope St. Damasus (13th November). A wonderworker, he is known to have raised several people from the dead. St. Zenobius was an early, but not the first, Bishop of Florence (Italy) and battled Arianism. He reposed circa 390, and is buried in Florence’s Cathedral of Saint Mary of the Flower.